The Masked Ace's Wrestling News Round-Up! Reigns/Cena - I was a bit surprised by the overcorrection here. We are kind of used to seeing Cena get hit with a bunch of finishers, only to turn Super Cena and come back with the win. This time, we saw Roman Reigns do the exact same thing to Cena. Part of me wonders if this isn’t a bit of an overcorrection. I am just not sure this will help Reigns get over. I think Reigns has a ton of talent, but there is a certain vocal element of the audience that just keeps trying to bury him. This was definitely a big time win, but we will see if it will allow Reigns to take over that top spot. Brock Lesnar retains over Braun Strowman - I think the WWE put themselves in a tricky spot by having both of these matches in the same night. Both of these matches could easily be WrestleMania matches. I was a little surprised to see Lesnar win, but I doubt it will slow Strowman’s rise all that much. If you need to lose to someone, make it the Beast Incarnate. Enzo Amore - Cruiserweight champion - Enzo lays claim to his first ever title win defeating Neville with the ol’ kick to the balls. Enzo’s heat was turned up a notch the next night on Raw when he came out in the last segment and started to antagonize the rest of the Cruiserweights. I thought this was a bit of an unusual segment to end the show, BUT, it was also really good. If the WWE was ever going to have a chance to succeed with 205 Live, this angle might be the one to do it. 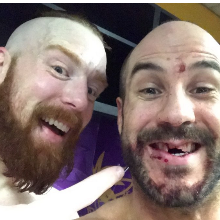 Cesaro gets teeth busted out - During the tag team title match with Rollins and Ambrose, Cesaro took a slingshot into the ringpost and busted two front teeth. I have to admiit, my first reaction to this was “Well, at least it wasn’t Rollins, so I don’t have to listen to the internet whine again about how unsafe he is in the ring.” The crazy part is this happened early in the match, and Cesaro still went on to have a match that basically stole the show. My love for Curt aside, I have to admit that WWE has done a great job making this dubious honor seem important. The video they posted on YouTube was pretty funny when you put it in context. And at least he gets to appear on WWE TV regularly! Asuka debt officially set for TLC - During the No Mercy pre-show, the announced that Asuka will be making her debut during the October 22 PPV, TLC. Curious if they will put her right in the main event picture or have her tear through the women’s roster for a while. As far as I know, I don’t think they have any real “enhancement talent” for women on the main roster, so she might be racking up some big wins real fast. Shield reunion for TLC? There is also a big rumor going around that the Shield will be reunited at TLC. TLC was where they made their in-ring debut a few years back, so this makes a lot of sense. I have always liked the Shield, so I would love to see that happen. Maria and Mike Kanellis announce they are having a baby - More baby news for WWE superstars. Just a few weeks after Miz and Maryse announced they were having a baby, now we get Maria and Mike in on the action. I guess this could all just be storyline, but that seems like a particularly weird choice. Not to say WWE hasn’t made some strange storyline choices in the past, but I am willing to suspend my disbelief here. If it’s not BS, congrats to both couples! The last few weeks, it seemed like we couldn’t go two days without hearing some bit of news about Cody Rhodes. 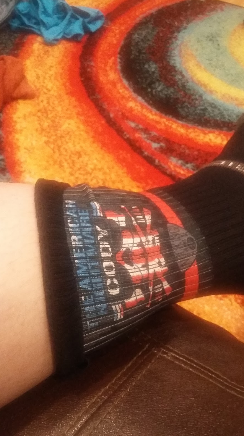 I actually am wearing my new American Nightmare socks when I sit down to write this. First, the Rhodes family is featured in Nocking Point Wine’s Wine Club this month. Along with your normal wines, you get those awesome socks and a bottle of wine dedicated to either Cody or Dusty. Nocking Point is owned by Stephen Amell, and I thought this was a cool way to honor the Rhodes family. CODY RHODES EXCLUSIVE TO RING OF HONOR! After an incredible run like no other this past year that saw Cody compete all around the world in promotions such as New Japan Pro Wrestling, Impact Wrestling, The Crash, APW, PWA Canada, and Northeast Wrestling just to name a few, The American Nightmare has decided to ink a domestically exclusive contract with Ring of Honor Wrestling, where Cody is currently the World Heavyweight Champion. The official signing of this contract will take place tonight at the ROH Television Tapings at Sam’s Town in Las Vegas and it will air in October. When asked about this, Cody said "I grew up in this business, I've seen its peaks and valleys...I know we are entering an unprecedented time in pro wrestling/sports entertainment and it’s time to put my flag in the sand. Joe Koff and his team put together such a generous offer...with some non-wrestling projects on the horizon that I hope to announce soon, and the potential of starting a family down the road...it was a perfect fit. Myself, Marty Scurll, Hangman Page, Matt and Nick Jackson...it's the dream team...like the 1992 dream team. I have several goals in mind for myself and for ROH and I can't wait to get started." Commentary: Considering how much success Cody seems to be having on the indys, I was kind of surprised to see him go exclusive with Ring of Honor. I wonder what this means for his indy dates. I have been fortunate enough to see Cody a few times working for Pat Bucks’ WrestlePro, and he always puts on a hell of a show. Ring of Honor can certainly use a headliner like Cody Rhodes. It feels like WWE has been taking all of their big names over the last few years. I honestly couldn’t even name ten people at Ring of Honor at the moment. I think it’s important for the WWE to have competition or else they seem to get a bit stagnant. A strong GFW/Impact, Lucha Underground, and Ring of Honor would be a very good thing as far as I am concerned. Obviously, I am no insider, so this is pure speculation on my part, but I would be inclined to think this has to be a work...right? I can’t imagine WWE would let something like this go on unless they allowed it. Personally, I would love to see a Bullet Club Invasion. It’s never made sense to me that with AJ, Finn, Gallows, and Anderson, WWE wasn’t trying to capitalize on that more. I just hope that unlike the WCW and ECW invasions, IF THIS HAPPENS, WWE ensures both sides stay strong or else they would be wasting the potential of these great performers. Terry Funk returns to the ring...at 73??? According to SESCOOPS, On Friday evening, WWE Hall Of Famer Terry Funk made his return to the ring at age 73. 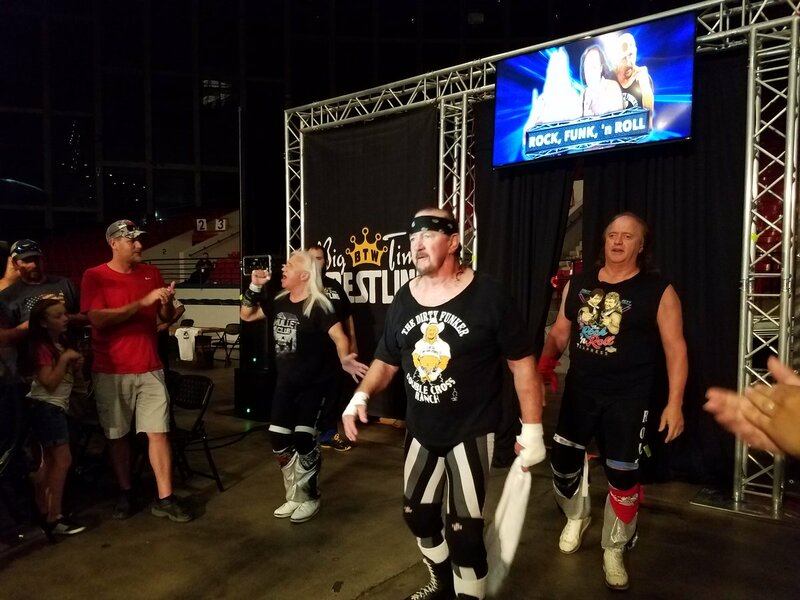 Bunk worked the Big Time Wrestling event in Raleigh, North Carolina, teaming up with the Rock ‘N’ Roll Express to take on Jerry “The King” Lawler, Brian Christopher and Doug Gilbert. As previously reported, Smashing Pumpkins frontman Billy Corgan had made a deal to purchase the National Wrestling Alliance (NWA) and assume ownership. PWInsider has a new report out today on the future of NWA, the transition of ownership from Bruce Tharpe to Corgan, and when Corgan will take over. According to the report, the new era under Corgan is slated to start on October 1. All the member promotions who had licenses to use the NWA initials and branding under previous owner Bruce Tharpe will expire the day before on September 30, which is this upcoming Saturday. Moving forward, the future of the NWA will be based on the new leadership of Corgan and Dave Lagana. Is there anyone who is a bigger money mark than Billy Corgan? I love the wrestling business too, but I am not for a second delusional to think I could ever run a wrestling company. And I really don’t think the NWA name has any real value these days. The WWF tried to do a NWA angle back in the late 90’s, and it went over like a fart in church (that bit of info and the analogy both come from Bruce Prichard’s awesome Podcast, Something to Wrestle With). Trying again 20 years later seems like absolute disaster waiting to happen. I said earlier that I want WWE to have more competition...this isn’t it. Ric Flair certainly got around the ring in his prime, but the legendary wrestler now says he doesn’t necessarily look back on his exploits with pride. The 68-year-old, who is fighting for his life after years of alcohol abuse, says he cringes to think that his grandchildren will know that he slept with roughly 10,000 women over the years — an admission he initially made to ESPN’s 30 for 30 in a special to air in November. What I said was the truth, but I feel bad now that I said some of it. Ten thousand women,” says Flair, who opens up in this week’s issue and to PEOPLETV about his iconic wrestling career and current health struggles. “I wish I hadn’t said that because of my grandkids,” he admits. I am really looking forward to that 30 on 30 special. Flair deserves to have his epic career documented. Last week on the " What Happened When" Podcast, Tony Schiavone and Conrad Thompson did a great episode about Ric Flair, so you should check that out. And that wraps up the wrestling news for this week. The Masked Ace signing off!